The funerary monument dominates at the top of the Hill of the Muses, that, along with its pedestal, rises approximately 13 meters high; erected in honour of the great benefactor of the city of Athens, Gaius Julius Antiochus Epiphanes Philopappos, prince of the Commagene dynasty (area of modern Syria). It is believed that architectural parts of the monument’s superstructure were used for the construction of the mosque’s minaret built on the Parthenon. Santangelo 1947, 153–253; Travlos 1960, 122–123. 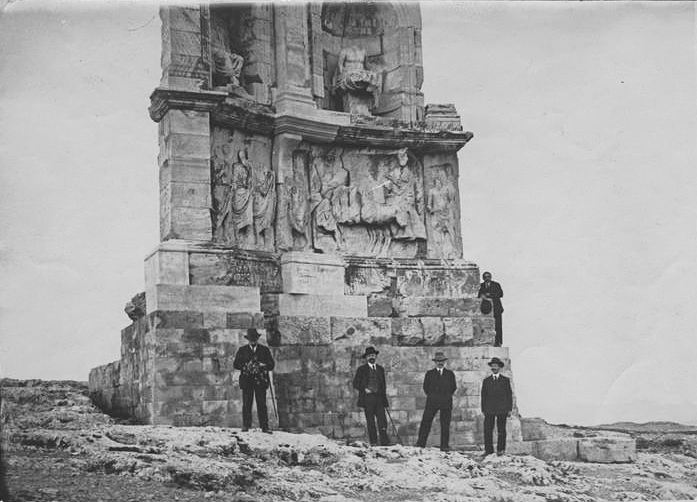 The monument of Philopappos, “pilgrimage” for those visiting Athens. Photograph taken in 1917.